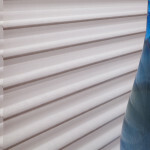 Shadings unite draperies, shades and blinds into one stylish design. Sheers are a premium shading system constructed of fabric vanes suspended between two sheer fabric panels. When the vanes are open, natural light is gently diffused creating an unobstructed view, smartly rolling up and disappearing into a sleek headrail when needed. By simply tilting the vanes, one is able to achieve a desired level of light and privacy. Vertical Sheers, like sheer shades, come in an array of sheer and soft fabrics for unlimited light control while providing the practicality of a vertical blind when closed.